As nearly all of the letters in the alphabet have been used up, we’ve now arrived at the letter Z for AlphaBakes. Initially I was a little puzzled as to what to make as zuccini isn’t in season in this part of the world and I didn’t fancy making zabaglione. Then I remembered the recipe I’d bookmarked ages ago for two-chocolate zebras, but couldn’t actually remember which book it was in. I hastened to my bookshelves and had a quick rifle through. Ah, there it was in Linda Collister’s The Great British Bake Off with a piece of paper marking the page. Now was obviously the time to make them. Creamed 125g unsalted butter with 100g vanilla (caster) sugar until light and fluffy. Beat in 1/2 tsp vanilla extract. Beat in 1 large egg. Sifted in 250g flour (half wholemeal spelt, half white) with ½ tsp baking powder and a pinch of pink Himalayan rock salt. Stirred this all together until all incorporated. Formed the dough into a ball, then divided into two equal pieces. Melted 45g white chocolate (vanillary G&B) gently in a bowl over hot water, then added it to one half of the dough, mashing it together until fully incorporated. Melted 45g of 85% dark chocolate (vanillary G&B) gently in the same bowl over hot water then added to the other half of the dough, again mashing together until all incorporated. Left in my cold kitchen to harden up for about 20 minutes. Rolled both pieces of dough out to form rectangles of 20 x 15 cm. Placed one on top of the other, then cut lengthways into three equal pieces. Placed these one on top of each to form a long rectangle of six layers. Pressed down gently. Cut slices (approx 5mm) and laid them on a lined baking tray. I only got 33 rather than the requisite 40 – obviously didn’t make mine quite thin enough. Transferred onto a wire rack to cool. Fiddly biscuits are not really my thing, but I was glad I made these as they looked quite impressive and weren’t nearly as fiddly as I thought they were going to be. They were also quite delicious with the sweet white chocolate contrasting nicely with the less sweet and more intense dark layers. The biscuits were nice and crisp with a buttery taste and it was hard to stop at only one – so I didn’t. Z is for Zebra Biscuits for this month’s AlphaBakes with Caroline Makes and Ros of The More Than Occasional Baker. I’ve had this recipe bookmarked ever since I first got the book The Great British Bake Off: Have to Bake by Linda Collister so I’m submitting this to Jac’s Bookmarked Recipes over at Tinned Tomatoes. I’m also entering these into The Biscuit Barrel with Laura of I’d Much Rather Bake Than … who has chosen chocolate as this month’s theme. Cute! I’ve made a zebra cake in the past, but zs are hard to come by! Thanks Johanna. Not the sort of biscuit I would normally make, but I’m glad I did as they weren’t nearly as much effort as I thought they’d be. Although I would like to know how to cut clean slices so the colours don’t leach. laughing at your non-fiddly biscuits! ANY baking is fiddly to me!!! These look good. For a while I’ve been thinking of making some snail biscuits using a similar method but haven’t quite got around to it yet. Snail biscuits sound interesting Corina. Is that the same sort of thing but in a roll? Ahh, that is what I have now discovered Amanda – phew! Thanks Jane, we’re enjoying the contrast between the sweet white and bitter dark chocolate layers. Great idea for Alphabakes, thanks for entering! Glad we’ve had a biscuit entry and not just cake as well. What ingenuity on the letter Z Choclette! They look mightily yummy, I’d happily wolf down a few with a cuppa. Yes please! so that’s what these little biscuits are called! 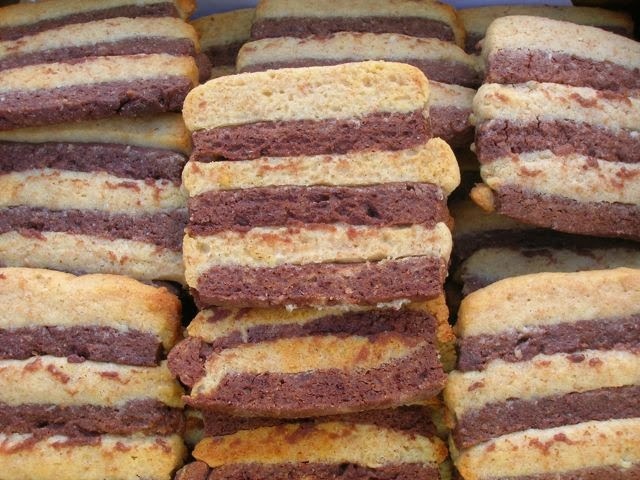 I make them, but call them layer biscuits…zebra biscuits is so much nicer. Beautiful stripes! These cookies look lovely! Very cute. I suspect I would eat them along their lines rather than bite across…but I can be odd like that! These look wonderful I am going to book mark and try. I rarely bake biscuits as I always burn them underneath and having lived with my gas oven for 11 years have only just learn the trick of standing another baking tray underneath them. Onwards to lots of biscuits now.